I’m your average stereotypical gamer, I work mainly in an office and have definitely packed on more than a few pounds since getting married and becoming a father. I have my own excuses for that but facts are facts; I seriously need to work out. So when I got the Xbox One for early review (in South Africa) the one thing I wanted to try out was the Xbox Fitness application which apparently uses the Kinect to monitor you properly while whichever personal fitness trainer you choose yells at you. This is not an in depth review of any of specific trainers or workouts as I’m no fitness expert so who knows which one is best or as good as a real life trainer. I just jumped in and tested a few out over a few days. As a beer drinker the obvious ones to go for are the aptly named Beautiful abs in 5 minutes and other nonsense like that. I was told needed a mat and some dumbells. I don’t own dumbells, or mats, so I ignored the mat and grabbed some heavy shoes. I can do this exercising thing. The next 5 minutes of my life are some of the hardest since I stopped playing sports. I was warmed up with long stretches then we went into weird twisting motions while hurling the dumbell between hands before starting some planking, push ups and leg lifts. The Kinect was about 90% accurate at telling me when I was doing it wrong and the grey scale onscreen display of myself showed which muscles were taking strain and how close I was to copying the lovely lady on the screen. By the end of it I was quite happy to take a 10 minute break, to rest from my 5 minutes of exercise. And was left in no doubt that if you did do this daily and didn’t cheat it would work an absolute treat. 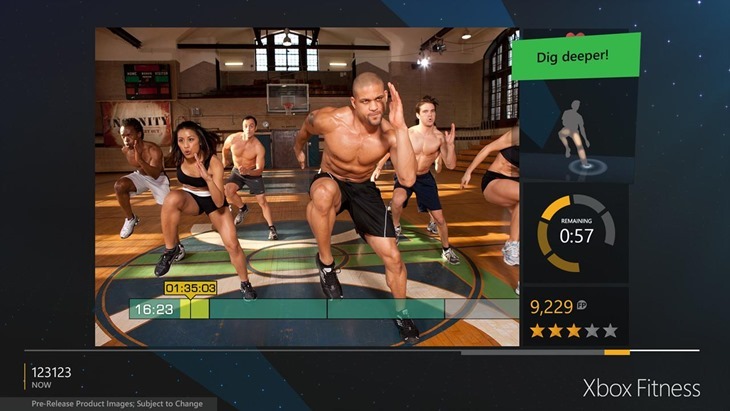 There are a ton of fitness movies and apps On the Xbox One and they all appear to utilise the Kinect pretty well. The problem though, as with all exercise, is that you can simply ignore it entirely. To try and motivate you they have a bit of a gamification system going so you can compete against yourself and others to reach certain goals. Something which overly competitive people who aren’t unfit will love, but not need. Apparently it’s also great with Yoga but there is no chance my leg can do that so I had to skip that. By the end of my testing I did realise one thing though; I have a genius plan. Create a fitness app that has your credit card details and if you don’t log in and complete your exercise on a daily basis I take R100 out of your account. So if you want a free day it’s no problem you just have to pay R100. I’ll be rich, stinking super rich I tell you. So if you really do want to get into shape and are about to buy an Xbox One you may want to fork out that extra cash for the Kinect. Hey it’s not like you haven’t wasted the same amount of money on a gym contract before. Xbox Fitness is not going to get you fit but if you are committed then it will definitely aid you in getting that body you really want. We're not scoring this one since every trainer is different and feel it would be unfair to lump them together as one.